The interface on the iPad Air 2 is something that will be familiar to anyone who's used an Apple product in the past. It was the first device (along with the iPad mini 3) to run iOS 8.1 right out of the box. Since launch Apple has applied some significant updates to its platform with iOS 9 first, and now the iPad Air 2 sports the latest version of Apple's operating system - iOS 12. Between iOS 8 and now plenty has been added and changed. iOS 8 and 9 are covered below in our original review, but key updates that have since arrived include Apple's Files app, new emoji, drag and drop, a redesigned App Store, a revamped Control Center, grouped notifications, Siri Shortcuts and screen time reports, among many other things. This all helps ensure that the iPad Air 2 still feels current and useful, despite now being quite old by tablet standards. Below you'll find our more detailed impressions of the interface based on previous software - though much of this will still apply. One iOS 9 feature exclusive to iPad owners is proper multitasking, enabled through three new modes. The first of these is Slide Out, which dedicates around a third of the screen to a second app. Then there's Picture-in-picture, which puts a window at the corner of the screen ideal for watching videos in while continuing to interact with other apps. Perhaps most useful of all though is Split View, which at launch was only available for the iPad Air 2 and lets you run two apps side by side, with each getting half the screen. The larger 9.7-inch screen of the iPad Air 2 is great for navigating around the grid of icons, but not so much if you're looking to use this device one-handed. Although if you are, you've probably not understood basic ergonomics. And possibly physics, as this is a two handed device and as such the lower weight makes it easy to tap and swipe around. 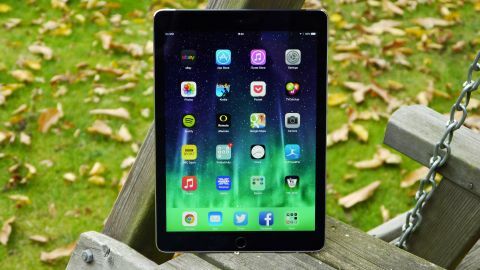 I won't run through the impressive tweaks that run through iOS 8, as they're ably covered in my colleague Matt Swider's iOS 8 review, but suffice to say that everything is much slicker on the iPad. Got an iMessage? The notification from the top of the screen lets you answer it without having to exit the app. Want to switch the Air 2 on silent? (This one is important as the hardware switch allowing you to do just that has disappeared) Then it's a quick trip into the Control Center, found at the bottom of any screen on the tablet - although it can be something of a nightmare trying to pull it up when swiping skywards from the home button. But anyway - you can look at the rest of that yourselves in the dedicated review - and iOS 8 works superbly on the iPad Air 2 and the update to iOS 9 improves things even further. What I want to talk about is the improved touchscreen responsiveness: it's brilliant. Clearly a response to Google's constant refinement to its Android software (which began with Project Butter in Jelly Bean and really made a difference to touching the front glass of Android devices) the iPad Air 2 features a much more responsive touch panel which makes it much simpler to register swipes through. It's one of those things that you don't really notice until it comes, as I never really thought the Air lagged previously. But the slick Samsung Galaxy Tab S showed that it could be so much better on a tablet, and Apple has stepped up here with the Air 2. And talking of stepping up - it's done something magical to that A8X chipset at the heart of the tablet. It's nearly 40% faster than the competition, including the iPhone 6 and 6 Plus and all the other top smartphones. In the GeekBench 3 tests, the iPad Air 2 averaged 4,500, compared to around 2,800 for any big handset you can think of. Apple promised big upgrades, but this is so huge that I have to wonder if there's some kind of optimization here - although the faster speed under the finger and smooth graphics (Zen Garden, for instance, runs much more smoothly on the Air 2 than the iPhone 6 Plus) show the improvements are evident in normal use too. That said, Apple has since outdone itself several times over, most recently with the A12 Bionic in the iPhone XS, iPhone XS Max and iPhone XR, and the A12X Bionic in the iPad Pro 11.